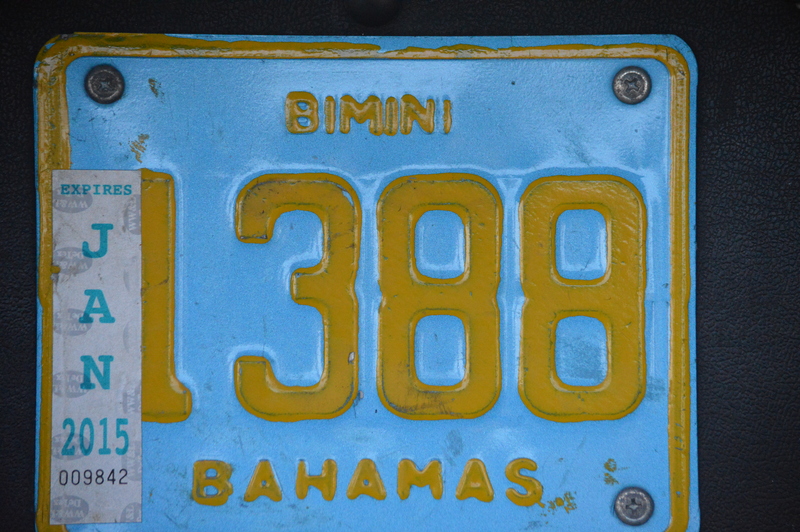 Bimini consists of three islands and is the closest Bahamian island chain to the US. Most cruisers come to Bimini to check in through customs and immigration, grab some diesel, spend the night at a marina for a night or two and be on their way to the farther out islands in the Bahamas. But our family has fallen in love with this hidden gem of an island and we are never in a rush to leave. We love our marina, Bimini Blue Water. The marina is simple but it does have hot showers and internet. The kids can’t believe they can take longer than a 2 minute shower and that they can leave the water running while they suds up. On our boat, water is limited so when we shower on board, it’s gotta be quick. Bimini is the only island where we plan to stay at a marina this year. We plan to be at anchor for the rest of our cruising. 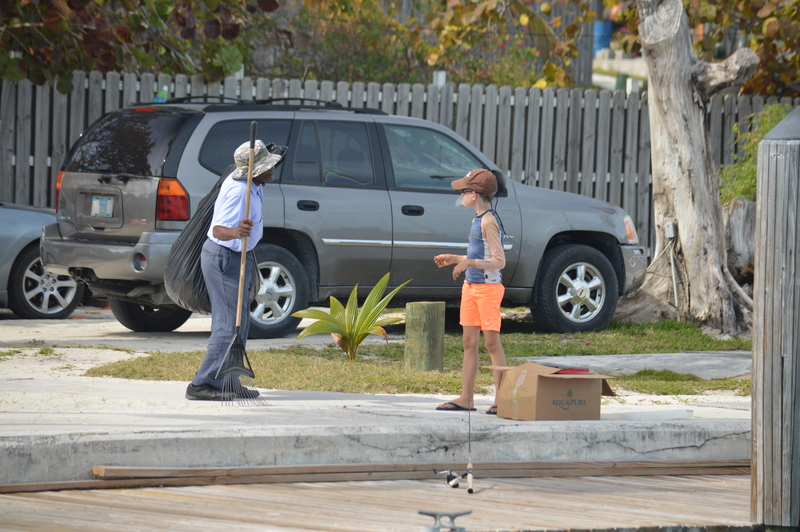 One benefit of being at a marina is the social aspect. We’ve really gotten to know the other cruisers that are staying here. Here’s a photo of some of our new friends. We’ve really enjoyed getting to know our next door neighbors, Vick and Marilyn from Newfoundland, Canada. They are a hoot and make us laugh all day. Vick gave Camden a shirt with the Newfoundland flag on it and Marilyn gives the kids treats all the time. And when we hear the ice cream truck coming down the road past the marina, Marilyn runs with Joellen and Camden to chase it down. We have gotten really close with two other cruising couples. We all hang out in the marina and at the beach together every day. Bennie and Lisa on S/V Rhiannon are from New Hampshire and are the friendliest couple. Lisa is teaching Joellen how to crochet. We are going to buddy boat sail with Bennie and Lisa from here to Eleuthera. John and Joanna are on S/V Kachina and are from Colorado. They are new grandparents and miss their granddaughter so are somewhat getting their fix with Joellen, Cam and Maria. We have been very inspired by a couple, Michele and Annie, from France. Annie is paraplegic and they have been sailing around the world. 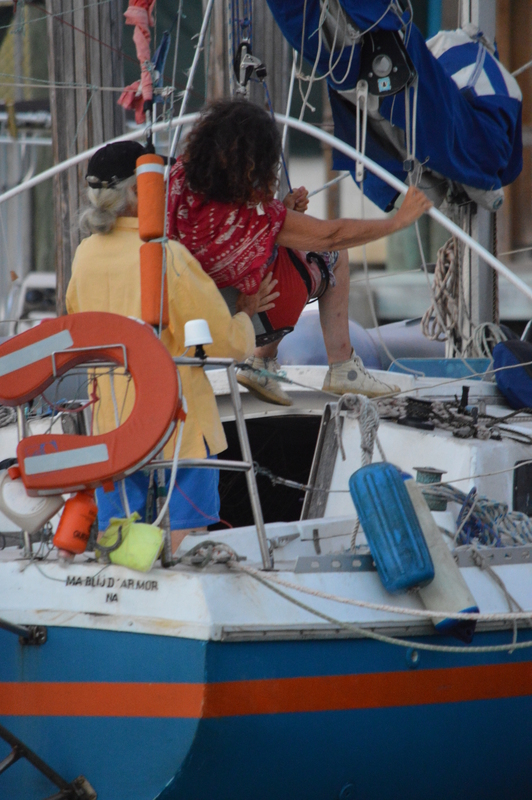 Michele lifts her into the boat with a sling attached to the boom. Annie jokes that she has to feed her husband a lot because he exerts so much energy helping her throughout the day. Annie has been wanting to get to the beach but she can’t put her wheelchair in the sand. So Michele and a few others lifted her into a wheelbarrow and wheeled her down to the beach. Then a little while later Michele, Marc and two other friends lifted her into the ocean where she floated and swam, which she hadn’t done in a long time. The whole beach was cheering and the smile on Annie’s face was the biggest I’ve ever seen. I’m so glad Joellen and Camden got to see it all. What an inspiration. A few days ago we went all around the island in a search for the most colorful conch shell. Bimini is known for conch and when the fishermen are done cutting out the conch, they toss the shells on the shore in piles. The shells are so beautiful that it is hard not to bring twenty of them on board. Space in limited, so we picked our favorite four. We first got to know Poppi because he is the maintenance guy at the marina. He is so sweet and helps Camden out when Cam can’t get the hook out of a fish’s mouth. We also ran into Poppi at church on Sunday. Then one day, Poppi brought his 4 year old granddaughter, Gina, over to the marina after school. Maria and Gina hit it off and played together for hours. At the beach one day, we met two high school girls that were walking home on the beach. They were the two most polite girls I have ever met. They are both from Jamaica but now live in Bimini. They invited us to visit the high school to see all the art work from the students so we plan on doing that today. At church on Sunday we met the priest and chatted for a few minutes after mass. Father Mendrela is from Poland but now lives in Canada and is celebrating his 50th year in the priesthood! He is in Bimini during Lent. Bimini does not have a permanent priest so they rely on retired priests from around the globe to come for months at a time. Last night we had Father Mendrela over for dinner on the boat. It was the first time he’d been on a sailboat and the winds were high so at dinner he got a little nervous when the boat was bouncing around. Joellen said, “Don’t worry about it. This is normal.” Father is a great story teller and the kids enjoyed listening to his stories about growing up. Marc and I enjoyed his stories about surviving a concentration camp during WWII, meeting Mother Teresa and meeting Pope John Paul II. Father Mendrela wanted his photo taken behind the wheel so he could send it to his family and look like he was sailing. What a fun night. While my favorite place in the Bahamas is the Exumas, Camden’s favorite place is Bimini because of the fishing. The fishing right off the dock at the marina here is great. Camden loves catching pompano. And he loves watching the manta rays and sharks swim by the dock. And last but not least…we LOVE the beach here in Bimini. Hands down, it’s the best beach combing beach we’ve found in the Bahamas. Every day right after homeschooling, we head straight to the beach. 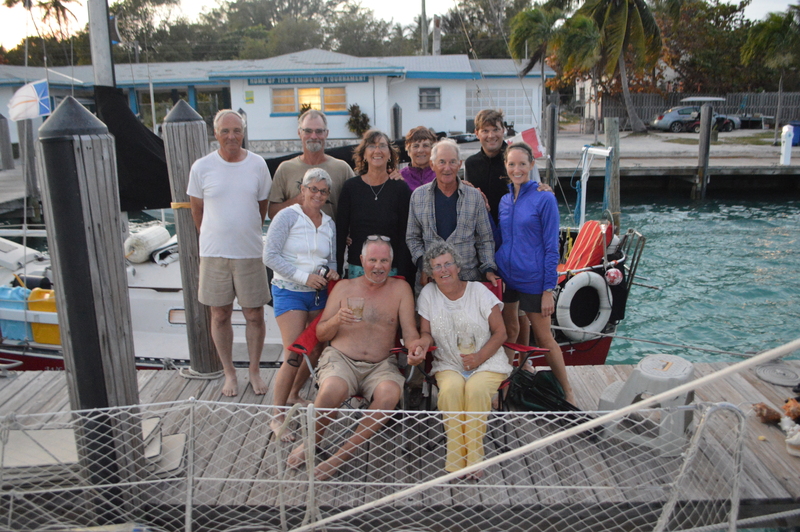 We will leave at first light tomorrow for a three day sail over to Eleuthera. But luckily we are returning to Bimini in early May on our way back to Fort Lauderdale. We just can’t get enough of this beautiful island. Adagio…Mambo loves Spot! I see you are sailing on The Tongue of the Ocean, some of the best fishing grounds. Go deep for that prize Wahoo, be lucky with the catch an good on the reel. You’ll catch one of the fastest fish alive. I expect to see photos of a monster. Oh, that 60 lb mahi you caught would have won a fishing tournament in Miami last week, the winner was only 45lbs. Chip, we caught a Mahi today but as Marc was gagging it, he got away. Cam was crushed. Still looking for Wahoo. That’s Camden’s dream. Back in the negative temps tonight and more snow/ice….. I just love your family beach pictures, they warm me up along with the great people stories…..
I’ve enjoyed reading about and sharing your trip! What great adventures for all. Enjoy your trip and travel safely as you enter this next phase of your journey. What a blessing it is to be your friend. Jen, do you remember Peggy from our CRHP team? She is fighting breast cancer so please keep her in your prayers. A continuing amazing experience for all! Beautiful pictures…happy faces!! Safe travels. Miss you guys! Jen thank you for sharing your lives with us. I so enjoyed Camden’s post. He must be so proud of himself. I get the feeling he will have the fishing and sailing bug in his blood forever. Your children will always have this wonderful childhood to remember. Be proud of yourselves too, as parents. You’ve given your kids something most parents don’t , so much of yourselves and the adventures of a lifetime! Thank you and keep up these wonderful posts! Wow. Thanks Dawn. Your words mean a lot. And yes, Camden has the fishing and boating bug. He’s already saving for his first fishing boat. Susan, thank you for your sweet words. Yes, the experiences outway even the beauty of the islands. We’d love to see you all when we are in Indy in June. Let’s keep in touch. I agree with Susan. When I read the stories. I think of how God is present in every moment of our lives. Thanks Christi. Marc just told me about your adventures in Paris. He really admires you. I feel the same about your family! You are a blessing! You always take the best photos Jen. Annie’s story is so inspiring — I can picture her smile from here! 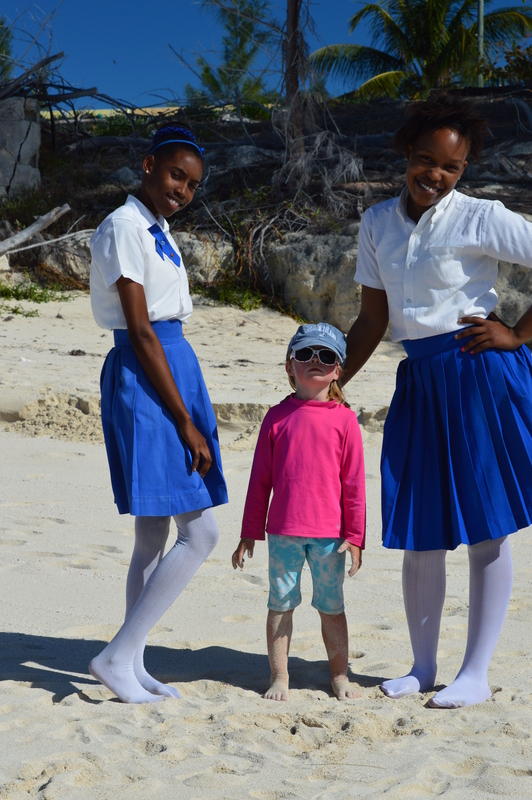 We are not surprised you are making new friends in Bimini — brings back great memories of our time there with you. Safe travels…. Morrins, not an hour goes by here at the marina when I don’t think of you all. What a special week last year in Bimini we had together. We miss you. Safe sailing! Oops that should have been the “Five” of you. Let’s not forget little Maria!! Jen this is an awesome blog. Glad we were stuck in No Name for so long and hooked up with your family. The four of you are a wonderful group and we love your children. Thanks for including us in your stories. Our first stop in the Bahamas has been so much fun with everyone. Joanna, we will miss you when we leave Bimini but can’t wait to see you in the Exumas. We love spending time with you and John. Fair winds.